There are a lot of ways are available if you’re you searching for proven ways to make money from your websites. Unfortunately still most bloggers are not able to generate much income from their blogging efforts. There are many reasons behind this, but the obvious reason is this: most bloggers don’t know which monetization model to follow. InfoLinks is one of the best income sources for bloggers who are tired of using AdSense. Most website owners and bloggers end up their imagination at Google AdSense when it comes to making money online from their websites and blogs. Google Adsense is a popular pay per click advertising program run by Google to help website owners make some extra earnings from their websites. When we think of Google AdSense Alternatives, There are lots of pay per click in-text advertising programs available that can help you earn some extra income from your website. Today’s post is about InfoLinks: one of leading company in in-text advertising. This company was started in 2007 and since then they have helped thousands of publishers make extra money from their websites. Most of publishers are satisfied with InfoLinks in-text advertising ads and are using it as a good alternative to Google AdSense. Lots of publishers are turning to this network as they are finding it hard to get approved in Google AdSense due to their strict TOS. We can use InfoLinks ads on our website in combination with other popular advertising networks like Google AdSense, Chitika, Adbrite ads etc. This ad network uses some keywords from a website to showcase advertiser’s ads. These in-text ads will look like normal links to website readers and thus will result in lots of clicks and money to be made for its publishers. The more clicks you get from your visitors, the more money you will make from InfoLinks. That’s it! Their Ads integration into a website or blog is as simple as 1, 2, 3. First you need to create a publisher account on InfoLinks and then need to paste the Java Script code in your website’s body section. In case you are running a WordPress based blog, InfoLinks integration can be much easier as there are plugins available to help you for the same. You can use their official plugin from WordPress plugin directory for easy integration of infolinks ads in your WordPress site. Like Google AdSense, you don’t need to manually place java script code on places where you want to show their ads. You need to add their code once into your website and rest will be taken care by their automated system. They will automatically start generating textual ads for certain set of keywords from your website pages. That means, using InfoLinks ads is much easier than using any other money making alternative source like AdSense etc. You can show InfoLinks ads on your website highlighted by single underline or double underline. And lots of monetization experts suggests using ads with single underline as in that case your in-text ads looks like normal links and there is every possibility your website readers will click on those ads as they are placed within your website content. To make sure, in-text ads look like normal links on your website, you can set the same color for your ad that you are using to show up regular links on your website. Most of the time, website links are shown in blue color and thus you can think of showing your text ads in blue color to match with regular links. So your website readers will be unable to differentiate between normal links and text ad links. This way you will be able to increase your InfoLinks earnings to great extent. By default, InfoLinks ads are shown up in green color and they don’t perform well as most of the time, they don’t match up with regular link color on your website pages. To increase your InfoLinks earnings further, you should start using some high paying keywords related to your website niche. You can use Google Adwords Keyword Tool to find some keywords related to a topic that you are writing about. Google Adwords Tool will show you the kind of bids advertisers are placing for those keywords. So you should incorporate some of high paying keywords into your article and get better earnings for every click made on InfoLinks ads that are placed on your website. But you should make sure, you are using relevant keywords only into your article and insertion of high keying keywords should not have negative impact on your article’s readability. I can’t stress enough about the prominence of finding the right keywords for your articles. The high traffic keywords you find the more relevant InfoLinks you can use on your pages to increase your revenue. If you are driving targeted visitors from search engines to your sites, you are obviously going to get more clicks from InfoLinks ads. So your revenue from InfoLinks also increases with the more number of click through rates. You can turn on or off InfoLinks ads on certain pages or certain sections of your website. If you like, you can turn off their ads in your website sidebars as you may be using this section to show more banners and links of monetization and also your website readers are using this section to find more interesting stories on your website. Ideally, you should turn off InfoLinks ads in your website header section, sidebars and footer section. And in case you still have any problem regarding ads integration or any issue you face with this network, you can use their Customer Support Section which will send answers to your questions in just 24 hours time. InfoLinks uses to pay on time to all publishers. Publishers can use Paypal, Bank Wire, ACH (Available for US Accounts only) and Prepaid MasterCard by Payoneer to accept their payments. Minimum payout in case of Paypal, Payoneer is $50 and for Bank Wire and ACH, minimum payout it $400. So it’s better to get a PayPal account if you want to get fast payments to your bank accounts as you only need to make $50 from InfoLinks ads if you are attached your InfoLinks network with Paypal. In case you don’t reach your minimum payout amount in any month, your earnings for this month will be added into your text month earnings. They are keeping a revenue ratio of 70:30 with its publishers which is highest revenue share given by a reputable advertising company in the industry. Google AdSense team use to pay up to 68% of total revenue to its publishers via their popular PPC advertising program. You can keep track of your earnings from your Publisher Dashboard. You can keep track of your earnings for today, this week, this month and year etc from your account. Apart from this, You can keep track of important stats related to CTR, eCPM and impression counts etc. from your Publisher Dashboard. Note: I’m no more using InfoLinks on this blog, the above screenshots were posted to give you a little motivation that you can too earn decent money each month from InfoLinks. If you remember InfoLinks started their ad network with intext ads but now they are offering three more ad type to its publishers namely insearch ads, intag ads and inframe ads. So if you are working as a Publisher with them, you will more reasons to smile and earn more revenue with them. As the name says, the ads will be seen as textual links on your web pages. With this ad pattern, some keywords from your website content will be converted into ads and these ads will look like normal links to your website readers. You will customize these type of ads to great extent like you can change their color and you will have the option to show your ad with a single or double underline. This is the BEST pattern to choose if you want to make more money from InfoLinks ad network. This is also similar to InText ads, but in this your ads are shown as tags instead of links. InTag ads are created using related tags and tag cloud. You can customize these ads as per your website design and they will shows as a collection of tags in between your website content. These kind of ads will help you monetize your search engine traffic and will have no impact on your website returning visitors. These ads will be shown to your website readers who end up landing on an unobtrusive overlay ad. Infolinks team is claiming usage of insearch ads could lower down the bounce rate and also can improve your website overall seo as in this case they are serving engaging ad units to your website users. If you have any doubts like how these ads will show up on your website content, you should check their demo section here. By looking at this link, you will have clear idea about all ad types that you can implement on your website and how they will look on your website. Click through Rate (CTR) remains on the higher side most of time as their ads are placed within website content. But make sure you’re not using too many InfoLinks ads just to increase click through rates. Or you’ll end up getting a bad user experience which can hurt your websites more than help! Earnings per click can be on lower side when compared with Google Adsense earnings. If you are not getting much traffic from US, your CPC will remain on lower side. InfoLinks ads are mostly useful when your site is new, once it starts getting more visitors, you will actually scare your visitors by using InfoLinks ads. So if you’re getting more traffic, either consider affiliate marketing or any other high paying income source for your sites. 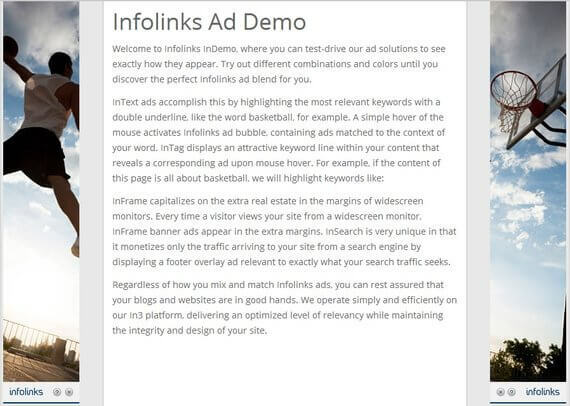 If you haven’t joined InfoLinks yet, Click This Link to Sign Up for InfoLinks ad network and start using their ads on your web pages to earn from your blogging efforts. Although there are several ways to make money blogging, InfoLinks still can be considered as one of the easiest ways to start making money. Making money from InfoLinks ads is really easy and even a new blogger can make money by increasing website traffic. Getting approval of InfoLinks is a cakewalk and you won’t find any strict rules in InfoLinks as you find in Google AdSense. There are mostly no strict banning when it comes to InfoLinks ads.